The US Senate Intelligence Committee's CIA “torture report,” which details the CIA’s use of torture on prisoners in the wake of 9/11, was released by the Senate on Tuesday. After four years of research at a cost of over $40 million, the findings unveiled the “enhanced interrogation techniques,” or EITs, used within the walls of covert, overseas prisons by the CIA. The report raised serious questions over controversial tactics which included sleep deprivation, waterboarding, rectal feeding, and others. Dianne Feinstein, the committee chair, admitted that the techniques were “torture,” though the word was never used in the report. The findings also revealed that the CIA’s treatment breached the body's legal mandate, as investigators said they found evidence of the intelligence agency’s systematic deception of Congress. Despite the methods used, the agency failed to gather information that foiled subsequent threats to US national security, the report found. Since the report's release, prominent human rights groups have demanded to prosecute the responsible US officials listed in the document. Despite widespread criticism and a wave of outrage sparked by the results of the Senate investigation, the Department of Justice (DOJ) said on Wednesday that it will not be pursuing charges against those involved in the interrogations. UN special rapporteur for torture Juan Mendez told RT that the report will likely create momentum that will lead to justice. He insisted that countries complicit in the CIA torture need to carry out their own investigations. “We have lived without prosecutions now for several years, but the experience shows that when truth telling is done honestly and sincerely, it generates a debate and the debate then generates a momentum towards justice,” he said in an interview on Thursday. Le Pen has previously criticized French President Francois Hollande’s close ties with the US and called on France to leave NATO. 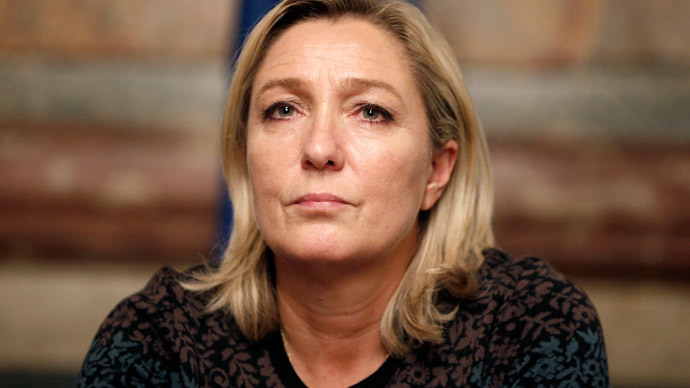 Speaking to RT's Sophie Shevardnadze in June, Le Pen said that NATO is an opportunity for the United States to extend its influence.